Probate court is generally necessary to transfer ownership of property and accounts upon someone’s demise EXCEPT for some narrow exceptions. A major exception is property held in joint tenancy ownership. 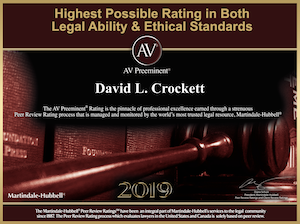 Attorney David Crockett can advise clients as to whether the joint tenancy exception is available and assist in preparing necessary documentation to create joint tenancies and to transfer the property to the survivor when one of the joint tenants passes away. Joint tenancy ownership is typically found in real estate ownership and in bank and securities account ownership. Joint tenancy property is created by deed, will, or other transfer to two or more persons in equal shares who are expressly declared to be “joint tenants”. Thus, if the deed to the house owned by John and Jane Doe states the grantees to be “John Doe and Jane Doe as joint tenants” a legal joint tenancy is created. Joint Tenancy an Alternative to Probate – Joint tenancy implies a right of survivorship and is the classic probate avoidance device. When one of the joint tenants dies, the surviving owner clears title to the joint tenancy property by following certain legal procedures and a Probate Court proceeding is not needed. Crockett Law Corporation can prepare the necessary documentation to clear the title. People who learn that probate is not needed to transfer ownership of joint tenancy property may conclude that they don’t need to bother with a Will or a living trust. In the case of a husband and wife with no children they can put their house and other assets in joint tenancy and avoid probate. Also, in the case of a single parent and a competent adult child who is the only heir, joint tenancy works well. However, where there are more parties involved, joint tenancy may cause unforeseen problems and disputes. One common example is where the parents have more than one child, putting a property into joint tenancy with all the children can give property to the children with no plan in place as to how to manage it. That can lead to litigation when the children can’t agree on property management or can’t agree upon selling the property or not. Property in joint tenancy is NOT affected by a person’s Will or a person’s living trust. People typically have plans in their will or trust to sell property or to hold it or to divide it up in certain ways. If the property mentioned in the will or trust is in joint tenancy, then the will or trust has no legal effect. With a will or trust, money or property can be held in the trust or the estate after the owner’s death which makes sense especially when there are minor children. Joint tenancy would have the property or account transfer to a child at age 18 with no strings attached.